Cecily Keim documents her adventures in life, crocheting, and other creative endeavors at SuchSweetHands.com. Throughout her life, regardless of the type of study or type of job, making things has always fascinated Cecily. Her great-grandmother, Mama Mac, taught her to crochet at age 9. Since hen crochet has become a favorite technique in her crafty arsenal. Cecily is mesmerized by the endless possibilities of crochet and loves passing on her enthusiasm as a writer, designer, and teacher. She teaches crochet classes and contributes her designs to magazines and books. She has also demonstrated her designs on the DIY channel's Knitty Gritty and Uncommon Threads. Cecily lives in Los Angeles, watches too much television, and loves candy, her cats, and her boyfriend. Kim P. Werker is the editor of Interweave Crochet magazine,. She is also the founder and Creative Director of CrochetMe.com, the online crochet community of innovative patterns, tips, and tutorials, and a playground for meeting crocheters from all over the world. After a couple of earlier flings, Kim got back into crochet in 2004. She is a professional member of the Crochet Guild of America and the National NeedleArts Association, and travels throughout North America to teach about crochet and to meet enthusiastic crocheters. She has appeared on the television show Uncommon Threads and will appear on the PBS shows Shay Pendray's Needle Arts Studio and Knit & Crochet Today. 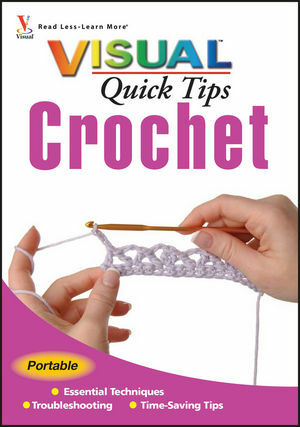 She was thrilled to work again with Cecily on this follow-up to their first book, Teach Yourself VISUALLY Crocheting. Kim's other books include Crochet Me: Designs to Fuel the Crochet Revolution (Interwave Press, 2007), Get Hooked, and Get Hooked Again (Watson-Guptil 2006 and 2007, respectively). Originally from New York State, Kim lives in Vancouver, British Columbia, with her husband and their dog. When she's not crocheting, writing, editing, or traveling, she enjoys reading, hiking, knitting, and playing in the garden.